If there's one irrefutable fact about citizenship, it's that you will, at regular intervals, find yourself in a lineup, whether you drive, fish, shoot, fly, travel, get married, renovate the bathroom or plan on getting sick. It's the sort of mundane wisdom you can't help but reflect on when, for instance, you're sitting with a couple of hundred citizens in a Service Ontario office, glancing nervously at the numbers on an LCD sign and wondering if a bar code tattooed on your forehead at birth wouldn't be an awful lot more convenient. 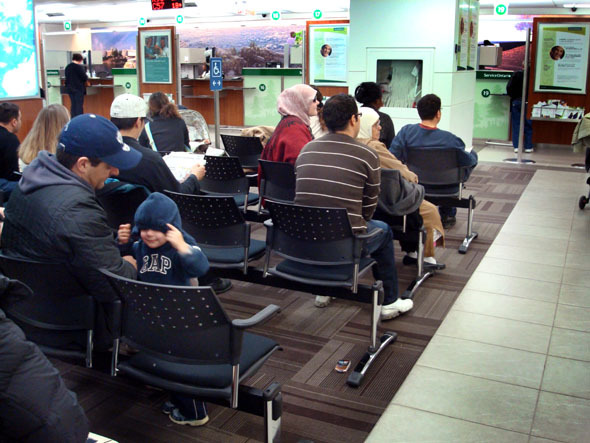 I'm here because my friend wants someone to corroborate his recent, awful experiences renewing his health card and paying a fine - both at the pleasure of Service Ontario, the province's retail face. He wants to know if I have the same horrible, Kafkaesque ordeal, which requires me to find some facet of my life requiring bureaucratic overhaul. In essence, he's the test, I'm the control. I settle on re-registering for my Health Card. I still have the red-and-white one I was issued decades ago, dirty and dog-eared from its long residence in a series of wallets; it still works, and has the added feature of never needing renewal, but the province would prefer if I'd upgrade to their picture ID with its shorter lifespan. It's something I might have put off indefinitely, but modern life seems to require increasingly verifiable proofs of identity - and more of them. A driver's license is the gold standard of official identification, but as a lifelong non-driver, I find myself too often provoking a dumbfounded glare from officials when I admit, sheepishly, that I don't have one. And so I commit the better part of an unseasonably fine weekday to the machinery at Service Ontario's College Park facilities. I show up just before noon, assuming that most people can only afford to sacrifice their lunch hour to the process, and immediately get issued a number: D128. I glance around the room; by a rough count, there are at least 60 people sitting in chairs or squatting against the walls in the half of the room nearest the reception desk, and at least that many in the other half of the space. I take a seat and ask the elderly couple behind me how long they've been there. Forty-five minutes, they say. I chuckle and tell them about the posted wait time, but they inform me that's for Health Cards - it's 2 Â˝ hours for driver's licenses, which is why they're there. A few seats away from them, a pretty girl with middle-eastern features is blank-faced while playing ferocious death metal on her iPod. This is Toronto, so I know not to expect much in the way of camaraderie while waiting. The best way to describe the atmosphere is resigned; there's not much in the way of hardship - the room is bright and recently re-done in that ominpresent airport departure lounge style, with flat panel screens playing helpful messages about the bureaucratic process and (thankfully) no muzak, which would be pointless as a quarter of the room are sporting earbuds. Still, the joylessness is palpable. There's a persistent joke that it was lineups, not sclerotic politics or economic implosion, that did in the USSR, and while watching your day dissolve waiting for a form to be initialed, it's nearly plausible; no one enjoys assuming a supplicant attitude to their government. Whatever else might be at stake in the battle over socialized medicine in the U.S., there's no doubt that avoiding this - or more of this - is what its opponents want to avoid. Almost everyone is killing time with their cell phones; just three people have newspapers, and only a couple are reading books. I see three families - just fathers, actually - with small children, all of whom are startlingly well-behaved. I try to read, but my eyes keeps cautiously lifting to check on the LCD sign; I see numbers prefixed with the letters B, C, G, J, K and L as well as D, and at one point spy both D114 and D123 displayed. Time, it seems, is going both forward and backward here. I made sure that I was well-supplied before sitting down - I have magazines and a book, a bottle of water and a bag of peanuts, and the cell phone and Zune are both charged. After half an hour, though, my music choice - The Opiates by Thomas Feiner, a famously bleak, melancholy record - is infusing the wait with an almost Soviet despair, and search for something more upbeat. Paolo Conte manages to make the rest of my wait almost amusing. I finally get my turn after nearly 90 minutes - not an unendurable wait, but a long lunch for someone with a real job. Outside I talk to Kate, who says she got out in about the same time, despite renewing her stolen Health Card and driver's license - a helpful official doing the former just put her back in the system for the latter, a tip worth remembering. She gratefully holds up her Blackberry and the copy of The Tipping Point that helped her kill the time. Walking out just after her, Frank tells me that he was only in there ten seconds - he came in to renew his fishing license and saw the lineup. "I'll do it online," he says.